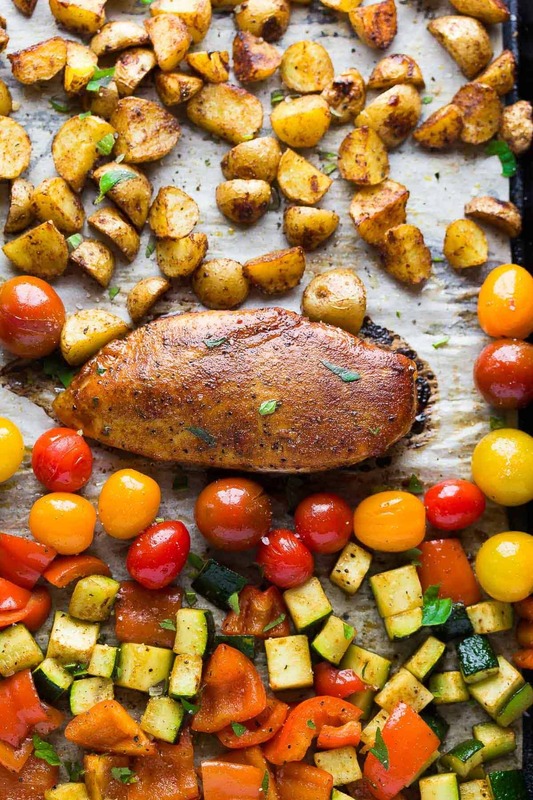 This paprika chicken sheet pan dinner cooks all up on the same pan with potatoes, bell peppers, zucchini and cherry tomatoes. Super easy and barely any dishes to clean! 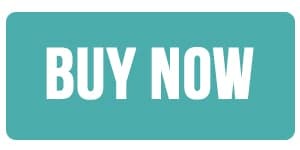 It’s day two of ’30 Minute Dinner Week’, which I’m celebrating because a) my new 30 Minute Dinners Cookbook is officially for sale, and b) it’s back to school time soon (or maybe already for you), which means easy dinners are a must!! 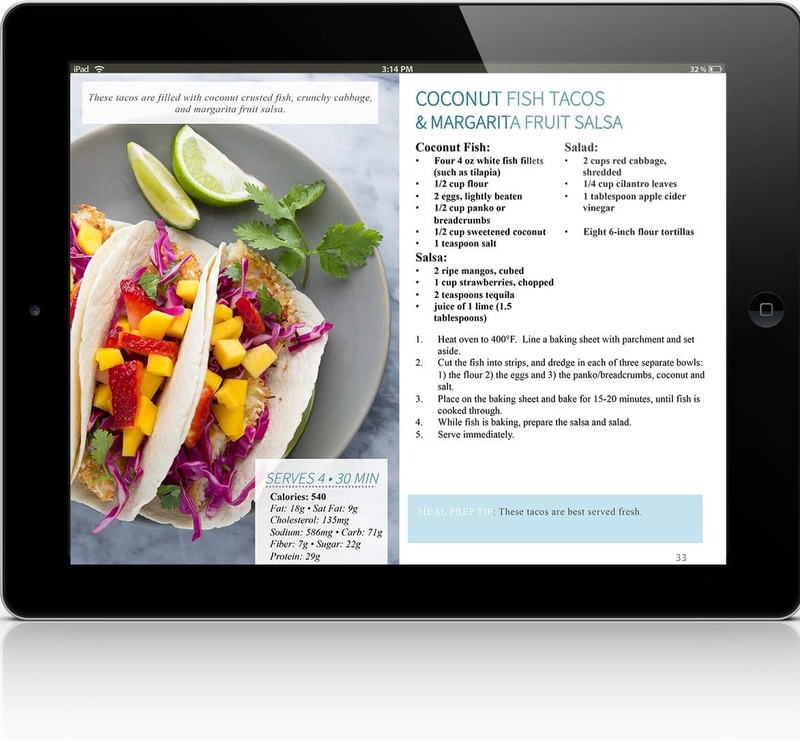 I had so much fun coming up with the 20 brand new recipes for this cookbook (along with the 20 recipes which are already published on this blog). 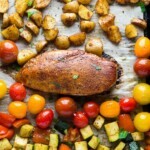 They are all super simple, and this paprika chicken sheet pan dinner stood out to me as being a ridiculously easy and ridiculously delicious example of the type of recipe you will find in the book. So I thought I’d share it with you. And I even made a video to demonstrate just how easy it is to make! When it comes to a simple chicken sheet pan dinner like this, I think I subconsciously lower my standards. I mean, it’s just SO simple. How can it taste good? Two words: that rub. The rub for this recipe is an adaptation of the brown sugar chili rub used for these Pan Seared Lamb Chops and these Brown Sugar-Chili Roasted Chickpeas, but I got rid of the chili powder and it’s pure paprika/brown sugar deliciousness happening here. Well, plus salt and pepper and some cayenne for a little heat. There is just something SO tasty about the paprika and brown sugar together…sweet and savory deliciousness. Then the cayenne gives it a little kick. Leave it out if you have kids or don’t want any spiciness, it’s still really delicious! 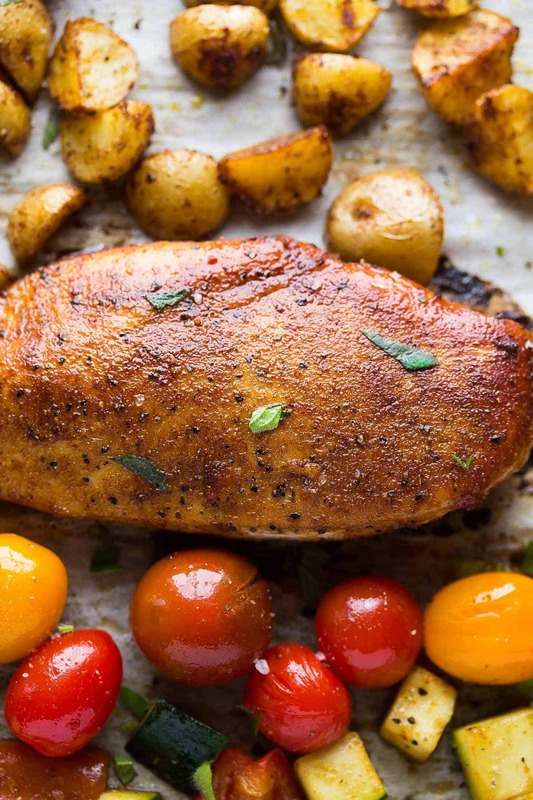 The rub does triple duty in this chicken sheet pan dinner: first it goes on the chicken. Then the potatoes get tossed in it. Then the veggies get tossed in it. It’s like a big brown sugar paprika party on that sheet-pan, and I’m not mad about it…not one bit. Due to the different cook times of the veggies, you will have to pull the pan out and add them at different times, but overall it is a really REALLY simple dinner recipe, and you are going to be impressed at how tasty it is for the effort. After cooking, the sheet pan is sprinkled with sea salt and oregano. Don’t skip the sea salt, it really enhances all of the flavors on this pan. Heat oven to 425°F. Line two baking sheets with parchment paper. In a small bowl, stir together the rub. Rub each chicken breast with 1 tablespoon of the rub, then place them on the baking sheet. In a large bowl, toss the baby potatoes with 1 tablespoon of olive oil. Add 2 tablespoons of reserved rub mixture and toss to coat. Arrange the potatoes on one side of each baking sheet. Bake the chicken and potatoes for 10 minutes. While chicken is baking, toss the bell peppers and zucchini with the other tablespoon of olive oil and additional 1 tablespoon of rub (or whatever is left). Add the cherry tomatoes to the pan and cook for 5 more minutes. Remove from oven, sprinkle with fresh oregano and coarse sea salt and serve immediately. Can you keep this refrigated for a few days? Just wondering if I wanted to add cauliflower to this, when should I put it on the sheet pan?. Picky hubby and eats only 3 veggies. I would try putting it in with the zucchini 🙂 Hope it works out! Made this tonight and even my super picky 7 year old asked for more. So delish!!! We just did our first sheet pan dinner last weekend and I am hooked! This is definitely going into rotation! And congrats on your book! So excited to see all the recipes! 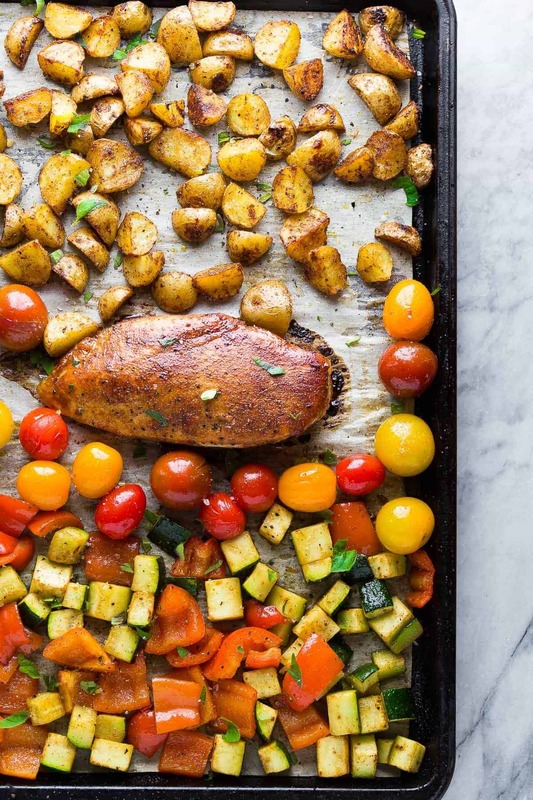 I need to add more sheet pan dinner recipes into my repertoire – starting with this one! Looks great, Denise! 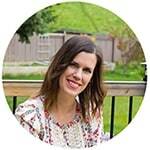 I just downloaded your book and can’t wait to dive into it! 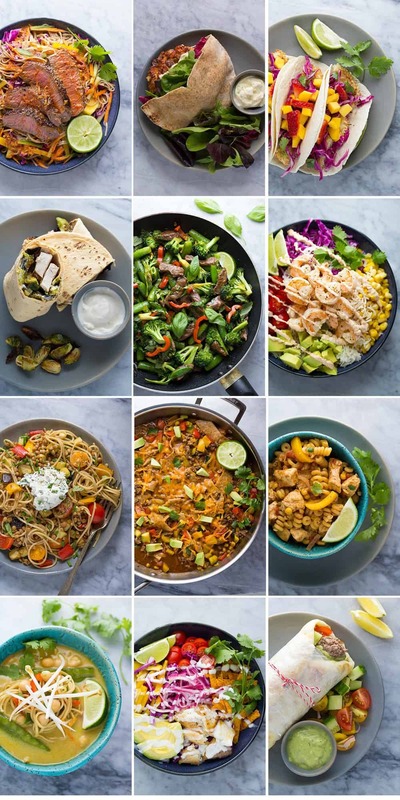 I love quick meals and yours always look delicious. Sheet pan dinners are something I’ve been making lately and I love the looks of this one with that rub! You always have the BEST dinner recipes, Denise! And such drool-worthy photos…I seriously want to dig into that chicken right NOW. 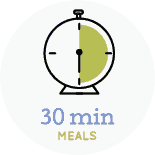 You’re a 30-minute dinner super star! You are way to kind, Rachel <3 Thanks so much! All hail the 30 minute meal queen! 😉 Love this sheet pan dinner, Denise! That rub sounds amazing and allllll those veggies are just screaming my name! This is exactly what I want my dinner to look like! Cheers, chicka! LOL I like the sounds of that, Cheyanne! Thanks so much, lady!